I plugged the numbers into random.org, and it gave me #11. Congratulations, Erin! Please email me using the "email" button on the left side of the blog. Thanks everyone! Have a great weekend! Here in Los Angeles, we are suffering the second Carmageddon. A great excuse to stay home and get crafty. Looking for the Elle's Studio giveaway? Click here! We've all seen those posters, right? Keep Calm and Carry On? And its many other iterations. I must fess up that I have a Keep Calm and Carry On poster. It serves me as a reminder to, well, keep calm. And carry on. 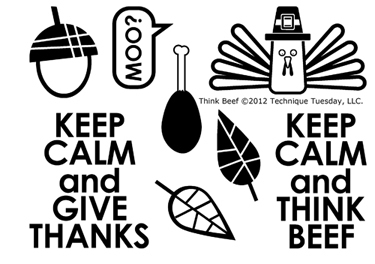 My friend Teri Anderson created the most adorable "Keep Calm and ... " stamps for Technique Tuesday. They are cute and fun and oh so perfect for cards. I used the Think Beef set to create this card. 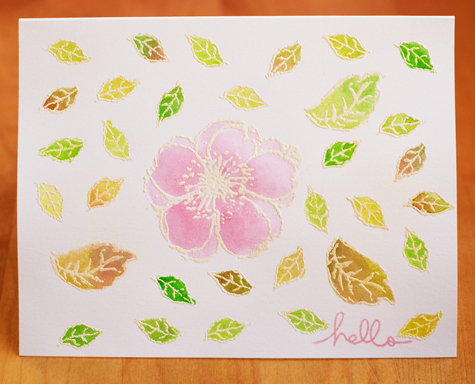 I stamped the leaves with various shades of brown, green, yellow, and orange. 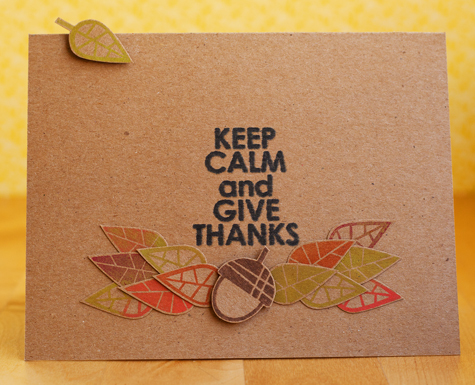 Cut them out, and layered them at the bottom of the Keep Calm stamp. I stamped the acorn, cut that out, and used a pop up dot to give it some lift. Finished the layout with a fly away leaf. Do go by the Technique Tuesday blog to see other projects made with these new stamps! Thanks for coming by today. 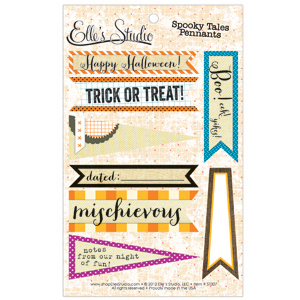 Today we are celebrating the release of Elle's Studio's two new lines for Autumn and Christmas: Spooky Tales and Be Merry ! They are hitting the stores this week and you can also get them at their website now! The Spooky Tales line works great for Autumn/Fall AND Halloween! And, the Be Merry line is perfect for Christmas layouts, cards, and would work great for your December Daily! And, as a bonus, with both lines they've also worked in tons of tags that are perfect for Project life! 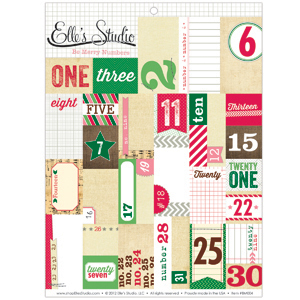 I've been an Elle's Studio fan for a long time, and my favorite Christmas item every year is any item that has numbers! Yes, I am a fan of using numbers in layouts. Check out this year's! So good, right? I'm also a sucker for anything Halloween and/or Thanksgiving. They are actually my two favorite holidays. My fave Elle's Studio products in this line? The pennants. I think they add just the right amount of fun and whimsy to any project. 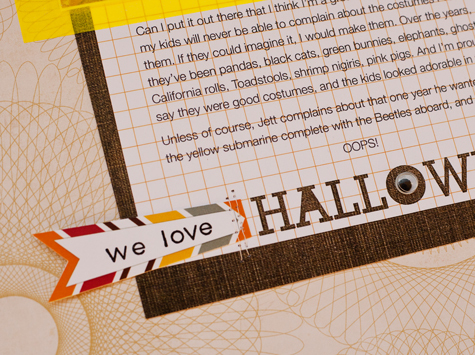 I used both in this layout (just a peek today) about the Halloween costumes I make for my children every year. 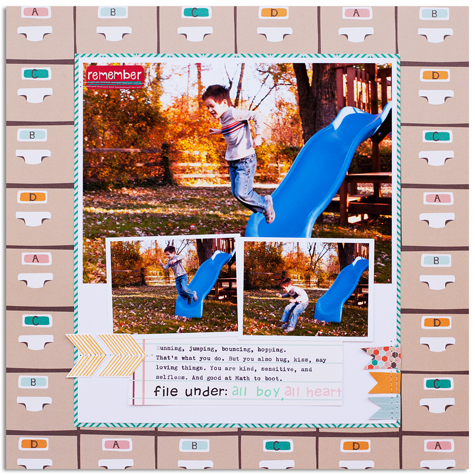 This layout came together quickly because with Elle's Studio's products, you don't have to hunt down all the perfect embellishments. They ARE the embellishments. Totally simple and awesome. The October gallery will debut on October 1st . Yes, that's a googly eye you see. Now the best part! I get to giveaway two of my favorite items from the new release to one lucky winner! Leave a comment to be entered to win my faves: the Be Merry Numbers and the Spooky Tales Spooky Pennants. I'll draw one winner on Saturday, September 29th, so make sure you check back to see if you've won! Linda < you are here! Hello again! I'm always a little surprised when I post two days in a row. It seems so miraculous... Ha! Today is day 3 of Lawn Fawn's Inspiration Week! The little flags are cut out of the Book Fair paper. The arrows on the left are from the awesome new set Interlocking Backdrops. And the words are stamped with Harold's ABC. Thanks for dropping by today! Don't forget to go by Lawn Fawn's blog and leave a comment to win! Hello there! 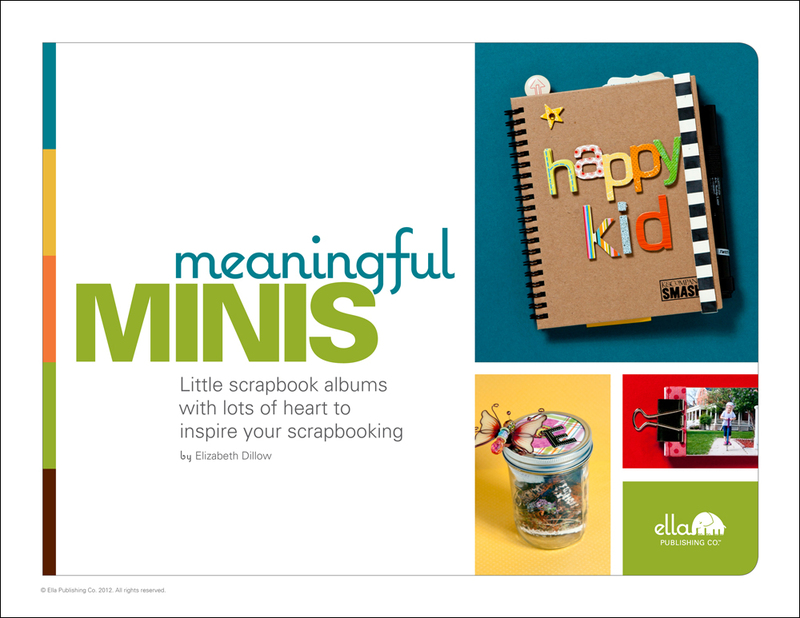 Lawn Fawn is having its September Inspiration Week. This means lots of eye candy AND prizes for you! Monday's focus is on the new paper line Fa-la-la! Click here to see all the products in this line. And as with everything Lawn Fawn, it's super cute! When I'm stumped design-wise, I usually return to this sketch: 8.5" x 11", photos across the middle, journaling below, patterned paper above. It's clean, it's well balanced, it's effective. 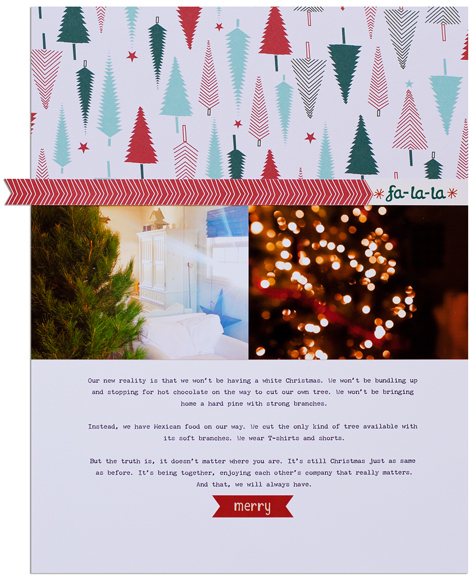 The Christmas tree paper is my favorite and it was perfect for a layout about Christmas trees! This was our tree from last year, in following our tradition of going out and cutting a fresh tree ourselves. There was a huge contrast between what our past tree cutting trips had been, and what they are now. Cold vs warm. Snow vs. sunshine. Hard pine vs. soft pine. Hot chocolate vs. Mexican food. Bundled up vs. T-shirts and shorts. And did I mention the palm trees surrounding the pines? Crazy! But in the end, it's not about the tree or the weather conditions. It's about what Christmas means to us. And that we can carry from location to location. The red chevron paper paper is actually the B-side of the brand/upc strip. And the Fa-la-la title is the name of the Elements sticker sheet. I love it when I can use every single piece of scrap! 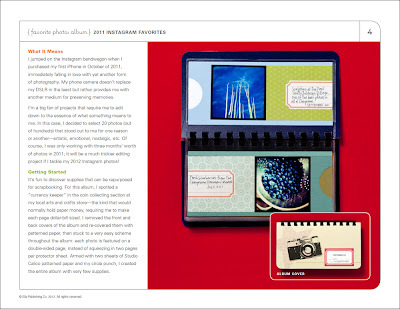 Don't forget to drop by Lawn Fawn's blog and leave a comment to win. Come back tomorrow for more Lawn Fawn projects. Have a great day! 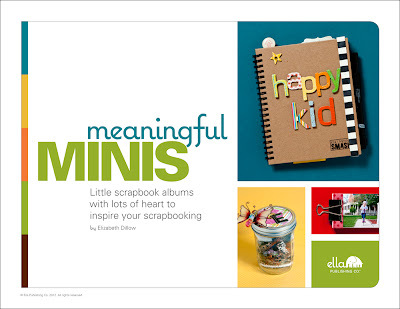 If you are looking for the Elizabeth Dillow's Meaningful Minis giveaway, please click here. 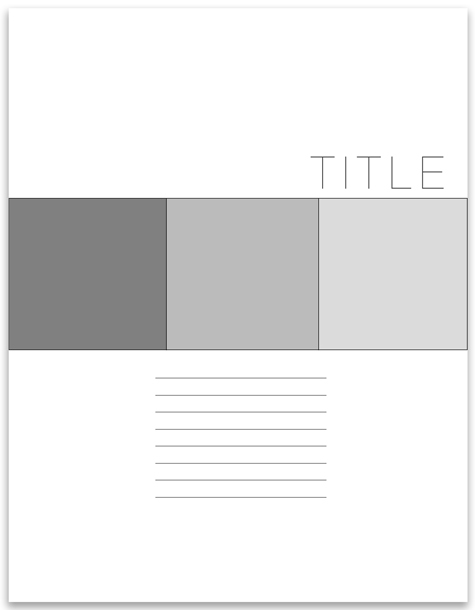 I mostly create layouts, and sometimes cards. But cards have always baffled me. I look through other people's blogs and I am in awe. How do they do that? I have come to the conclusion that I need to stick to simple. It's what feels most like me. Although that's not to say that I don't want to learn to new techniques. On the contrary, that's one of the most exciting things about stamping. There's so much to learn! 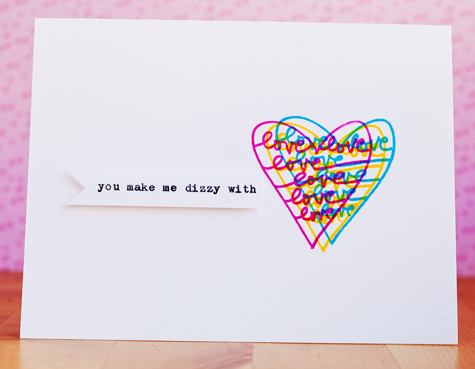 Here are two cards that are simple and pretty darn easy to make. I used Technique Tuesday's latest stamp release. This second one took a little more work. But not that much more. And it was fun! I stamped the images with Versamark and embossed them with some white Zing. Then I went to town with Technique Tuesday's watercolor crayons. It's one of those techniques that look like it took a lot of time and effort, but it didn't. A win-win, if you asked me. 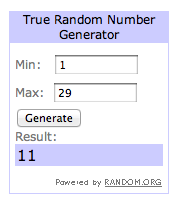 ETA: I've plugged the numbers into random.org, and the winner is Caroline Hackney! Congrats! You are going to love this book. Whatever you make, make it meaningful. The beauty of a mini-album is that you can pack BIG memories inside. And these are projects with a clear beginning and end, which means you get to accomplish something grand and set the finished product on the shelf for all the world to see, flip through, and enjoy. Aren't you dying to think mini? *Yes, we made up a word, but we're in good company. Shakespeare made up words all the time. I just finished downloading and reading through the book, and it's full of ideas I want to recreate. And this is from someone who's not a mini-album person at all! My first one will be Instagram Favorites (see above). Followed by Family Maps. But don't take my word for it. (I am a huge fan of the Reading Rainbow and always wanted to say that. Yes, I'm a dork.) Leave me a comment telling me which is your favorite book of all time (it doesn't have to be scrapbook related), and I'll pick a winner this Friday to win a copy of Elizabeth's book. Remember to leave me your email address or a link back to your blog.